Abkhazia’s Strategic Partnership Agreement with Russia may be unpopular among the break-away republic’s population, but the government is keen to implement it and is clamping down on dissent. 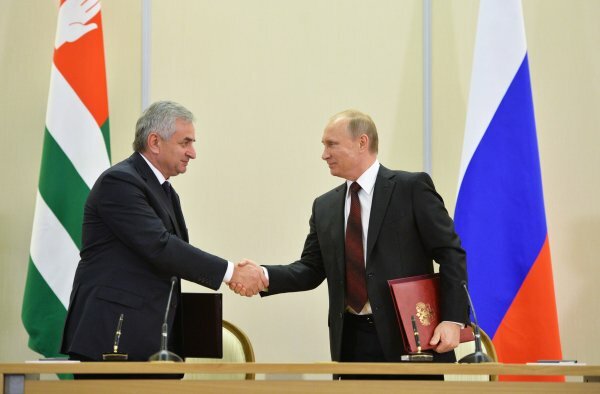 On 22 December 2014, Abkhazia ratified the Strategic Partnership Agreement with Russia The agreement was negotiated against a background of dissent from a significant part of the self-proclaimed republic’s population, and of continuous government pressure on activists and bloggers who opposed the ratification of the agreement. Abkhazia is de jure part of the Republic of Georgia, but has functioned as an independent state since 1992. The region has fought one major war and several bloody skirmishes with Tbilisi’s forces over the last 23 years. Russia moved to recognise Abkhazia as an independent state following its own war with Georgia in 2008, and acts as a key source of diplomatic and financial support to the region. The Strategic Partnership Agreement calls for the ‘coordination of foreign policy’ and ‘creation of a common defence and security space.’ It also provides for ‘the creation of conditions for the participation of Abkhazia in integration processes on the post-Soviet space, realised at the initiative of and (or) with the co-operation of the Russian Federation’ and ‘the creation of a united force of the Armed Forces of the Russian Federation and the Armed Forces of the Republic of Abkhazia.’Revolution and ratification In order to avoid protests and opposition rallies, prior to ratifying the agreement, the Abkhazian authorities presented the document for public hearings. The majority of the population was against the agreement, viewing it as a threat to their hard-won independence. The opposition maintained that despite its name, the agreement was not a partnership, more a gunshot marriage, as it delegated a wide range of powers to Russia, particularly, in the areas of military control and foreign policy.The majority of the population was against the agreement, viewing it as a threat to their hard-won independence. After a special Abkhazian committee of parliamentary deputies made corrections to the document and excluded several controversial articles (such as simplification of the citizenship procedures for ethnic Russians in Abkhazia) the document was ratified by the parliament. President Raul Khajimba had promised to sign the cooperation agreement with Russia after taking office. Considering that 90% of parliament is loyal to the new president, the outcome wasn’t surprising. Experts believe these ratification guarantees, to be the reason Moscow declined to intervene in the May 2014 Abkhazian revolution and ensuing power transfer between government elites. President Aleksandr Ankvab was forced to resign following a wave of public protests against his government’s handling of numerous issues, including the economy. Tellingly, Vladislav Surkov, special envoy of the Russian president to Abkhazia and a powerful figure in Putin’s circle, visited the country during the revolution and held negotiations with then opposition leader Raul Khajimba but not with Ankvab. Not long before the revolution in Abkhazia in 2014, local media published an interview with Taras Shamba, a prominent Abkhazian public figure, on the necessity of the co-operation agreement and integration between Abkhazia and Russia. The idea of integration had been floated prior to the revolution, and had perhaps even been discussed with former president Ankvab. Following his resignation, Ankvab announced that Abkhazia now faced the prospect of losing its independence. A sequence of momentous events in Abkhazia in 2014 – revolution, early presidential elections, ratification of the partnership agreement with Russia in December – split Abkhazian society into two opposing camps – supporters of former president Ankvab and followers of Khajimba, a former agent in the Soviet (and then Abkhazian) KGB. While both publicly endorse Russia’s presence in Abkhazia as a guarantee of the region’s security, Khajimba’s opponents advocate limiting Moscow influence.A society divided The divide runs through the two most influential political parties in Abkhazia whose membership is dominated by veterans of the Georgia-Abkhazia conflict – ‘Amtsakhara’ (the opposition bloc) and ‘Aruaa’ (supporters of the agreement). During the early presidential elections in July 2014, the Amtsakhara-supported candidate, Aslan Bjania narrowly lost to Raul Khajimba. Bjania later harshly criticised the agreement with Russia. The party claimed that public hearings and discussion of the document were pointless since the ratification would erode the country’s independence. Conversely, Aruaa supported Raul Khajimba and the agreement’s ratification. The only platform where people opposing the partnership agreement could voice their opinion was Facebook. The partnership agreement nevertheless received strong support inside the republic and enjoyed the backing of regional media, particularly through state television channel AGTRK. The only platform where people opposing the partnership agreement could voice their opinion was Facebook, which had become a popular source of information during the 2014 revolution. According to public opinion polls, 38% of Abkhazians use social media as their daily source of information, the two most popular sources being Arsmira and Agate. Arsmira was established by the Journalist Association of Abkhazia at the initiative of Izida Chaniya, the editor-in-chief of the magazine Nuzhnaya. The platform had been strongly supportive of the Abkhazian opposition that came to power during the revolution in August 2014. Immediately after his victory, President Raul Khajimba awarded Izida Chaniya the prestigious Order of Akhdz-Apsha (Third Degree) for her contribution to the development of Abkhazian mass media. Both forums are invitation-only and not open to the general public, as are most of the media-themed Facebook groups in Abkhazia, primarily due to members' fears of speaking openly in such a small society. Arsmira, one of the main supporters of the Abkhazian revolution and Khajimba’s presidency, supported the partnership agreement with Russia. Agate, on the other hand, had been opposed to the agreement from the very beginning, accusing the new government of abandoning Abkhazian national interests. Following Raul Khajimba’s presidential victory and ensuing ratification of the partnership agreement with Russia, there has been a significant increase in human rights abuses. Recently, the Georgian minority of the Galsky district has come under severe pressure. Timur Nadaray’s appointment to the post is not merely incidental given the sensitivity of the ‘Georgian issue’ in Abkhazia. He is a former colonel in the Abkhazian armed forces, a veteran of Abkhazia’s war with Tbilisi in 1992-1993, deputy head of the war veterans’ movement Aruaa, now the ruling party. His appointment comes during a time of increasing militarisation in Abkhazia and is in keeping with the new government’s strategy. Another alarming trend following Khajimba's victory has been increased pressure on freedom of speech. Another alarming trend following Khajimba's victory has been increased pressure on freedom of speech. Arsmira, once the main supporter of Raul Khajimba on Facebook during the presidential elections, suddenly became the main proponent of rigorous censorship in social media. This was particularly ironic given that they had risen to prominence exposing corruption in the government of the former president Ankvab. On 23 January, Arsmira sent a request to Procurator General Aleksei Lomiya to introduce libel regulations for information disseminated on social media. This initiative is directed at stifling bloggers, particularly from Agate, which remains the only independent media platform where Abkhazians can discuss relevant political and social issues, including the partnership agreement with Russia. Traditional media in Abkhazia remain under pressure from the government. Thus, after becoming president, Raul Khajimba fired the management of AGTRK, which led to a change of editors at Abkhazia’s state press agency Apsnypress. The warning was also issued to the independent TV channel Abaza TV. For the time being, the only free platform in Abkhazia remains social media. Given the fact that Abkhazia’s small territory is ever under the watchful eye of the security services, bloggers have to work anonymously. There have been cases where a blogger was identified and threatened because of a Facebook post. This is not a partnership agreement between equal partners. But the closer Abkhazia is to partnering and integrating with Russia, the more it adopts Russian methods of controlling and repressing basic freedoms.